The Battle of the Saintes was fought April 9-12, 1782, during the American Revolution (1775-1783). Having won a strategic victory at the Battle of the Chesapeake in September 1781, Comte de Grasse took his French fleet south to the Caribbean where it aided in the capture of St. Eustatius, Demerary, St. Kitts, and Montserrat. As the spring of 1782 progressed, he made plans to unite with a Spanish force before sailing to capture British Jamaica. Grasse was opposed in these operations by a smaller British fleet led by Rear Admiral Samuel Hood. Aware of the danger posed by the French, the Admiralty dispatched Admiral Sir George Rodney with reinforcements in January 1782. Arriving at St. Lucia in mid-February, he was immediately concerned about the scope of British losses in the area. Uniting with Hood on the 25th, he was equally disturbed by condition and supply situation of his compatriot's vessels. Shifting stores to compensate for these deficiencies, Rodney deployed his forces to intercept French reinforcements and box de Grasse into Martinique. Despite these efforts, some additional French ships reached de Grasse's fleet at Fort Royal. On April 5, the French admiral sailed with 36 ships of the line and steered for Guadeloupe where he intended to board additional troops. Pursuing with 37 ships of the line, Rodney caught up to the French on April 9, but fitful winds prevented a general engagement. Instead a minor battle was fought between Hood's van division and the rearmost French ships. In the fight, Royal Oak (74 guns), Montagu (74), and Alfred (74) were damaged, while the French Caton (64) took a heavy battering and steered away for Guadeloupe. Using a freshening wind, the French fleet drew away and both sides took April 10 to rest and repair. Early on April 11, with a strong wind blowing, Rodney signaled general chase and resumed his pursuit. Spotting the French the next day, the British bore down on a French straggler forcing de Grasse to turn to defend it. As the sun set, Rodney expressed confidence that the battle would be renewed the next day. With dawn breaking on April 12, the French were sighted a short distance away as the two fleets maneuvered between the northern end of Dominica and Les Saintes. Ordering line ahead, Rodney turned the fleet to head north-northeast. As Hood's van division had been battered three days earlier, he directed his rear division, under Rear Admiral Francis S. Drake, to take the lead. Leading the British line, HMS Marlborough (74), Captain Taylor Penny, opened the battle around 8:00 AM when he approached the center of the French line. Easing north to remain parallel with the enemy, the ships of Drake's division passed the remaining length of de Grasse's line as the two sides exchanged broadsides. Around 9:00 AM, Drake's rearmost ship, HMS Russell (74), cleared the end of the French fleet and hauled wind. While Drake's ships had taken some damage, they had inflicted a severe battering on the French. As the battle progressed, the strong winds of the previous day and night began to temper and became more variable. This had a dramatic effect on the next stage of the fight. Opening fire around 8:08 AM, Rodney's flagship, HMS Formidable (98), engaged the French center. Deliberately slowing, it engaged de Grasse's flagship, Ville de Paris (104), in a protracted fight. As the winds lightened, a smoky haze descended on the battle impeding visibility. This, along with the wind shifting to the south, caused the French line to separate and bear to the west as it could not hold its course into the wind. The first to be affected by this shift, Glorieux (74) quickly was pounded and dismasted by British fire. In quick succession, four French ships fell afoul of each other. Sensing an opportunity, Formidable turned to starboard and brought its port guns to bear on these ships. Piercing the French line, the British flagship was followed by five of its comrades. Slicing through the French in two places, they hammered de Grasse's ships. 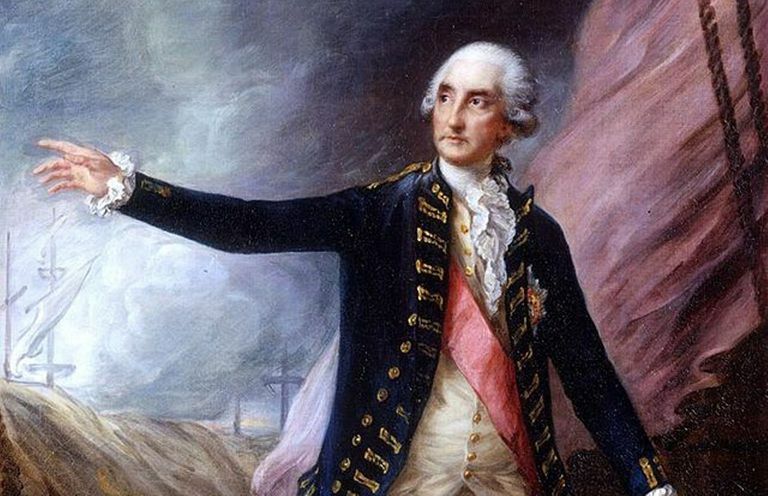 To the south, Commodore Edmund Affleck also grasped the opportunity and led the rearmost British ships through the French line inflicting significant damage. With their formation shattered and their ships damaged, the French fell away to the southwest in small groups. Collecting his ships, Rodney attempted to redeploy and make repairs before pursuing the enemy. Around midday, the wind freshened and the British pressed south. Quickly capturing Glorieux, the British caught up to the French rear around 3:00 PM. In succession, Rodney's ships captured César (74), which later exploded, and then Hector (74) and Ardent (64). The final capture of the day saw the isolated Ville de Paris overwhelmed and taken along with de Grasse. Breaking off the pursuit, Rodney remained off Guadeloupe until April 18 making repairs and consolidating his fleet. Late that day, he dispatched Hood west to attempt to head off those French ships which had escaped the battle. Spotting five French ships near the Mona Passage on April 19, Hood captured Ceres (18), Aimable (30), Caton, and Jason (64). Between the engagements of April 12 and 19, Rodney's forces captured seven French ships of the line as well as a frigate and sloop. British losses in the two fights totaled 253 killed and 830 wounded. French losses numbered around 2,000 killed and wounded and 6,300 captured. Coming on the heels of the defeats at Chesapeake and the Battle of Yorktown as well as the territorial losses in the Caribbean, the victory at the Saintes helped to restore British morale and reputation. More immediately, it eliminated the threat to Jamaica and provided a springboard for reversing the losses in the region. The Battle of the Saintes is generally remembered for the innovative breaking of the French line. Since the battle, there has been great debate as to whether Rodney ordered this maneuver or his fleet captain, Sir Charles Douglas. In the wake of the engagement, both Hood and Affleck were highly critical of Rodney's pursuit of the French on April 12. Both felt that a more vigorous and protracted effort could have led to the capture of 20+ French ships of the line. How Did the Battle of Monmouth Win the North for the Americans?